Ladies and Gentlemen we have a new join to our pumpkin beer family! 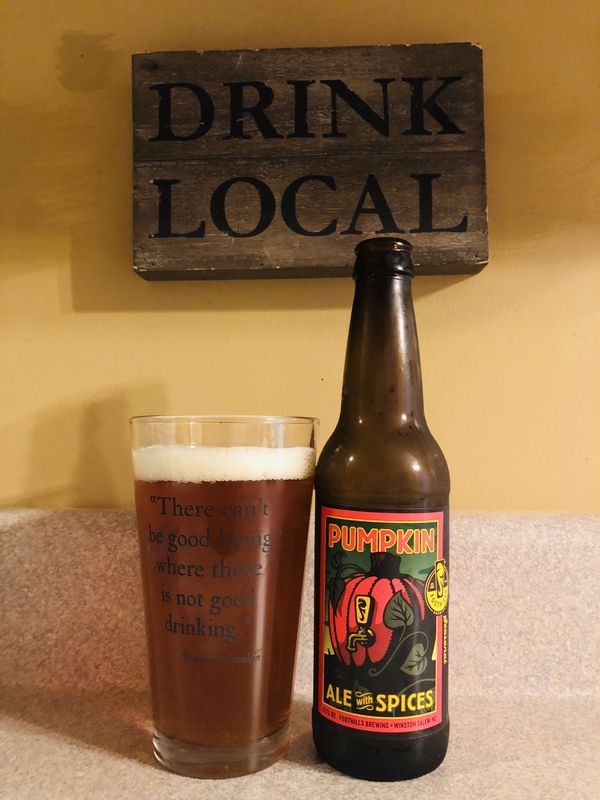 Foothills brewing from Winston-Salem, NC has developed a very worthy pumpkin beer. The name is very clear in describing what your in store for, Pumpkin Ale with Spices. The color is a very nice copper, the smell is light with the hint of pumpkin spice. The taste is quite nice, the right amount of spice, caramel and pumpkin. It’s a dry Ale so it doesn’t linger after you swallow. The alc content at 5.7% is perfect to allow you to enjoy this throughout the day without getting hammered or too full. I have enjoyed this beer and will get it again. 4 stars, enjoy.